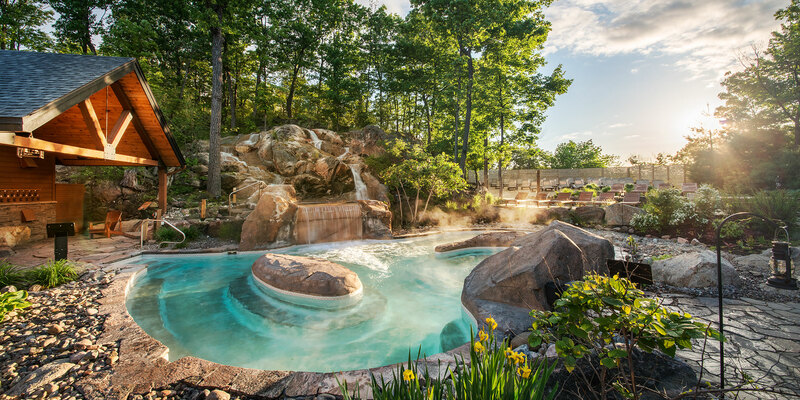 Nordik Spa-Nature boasts an impressive variety of outdoor pools. 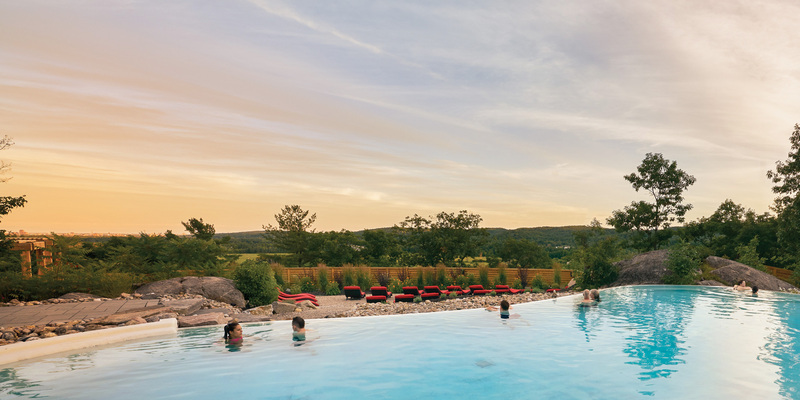 Surrounded by a natural and bucolic environment, each pool is unique and offers its own distinct experience. Whether you’re here with your friends or by yourself, visit the 3 different areas of the site to discover your own paradise. 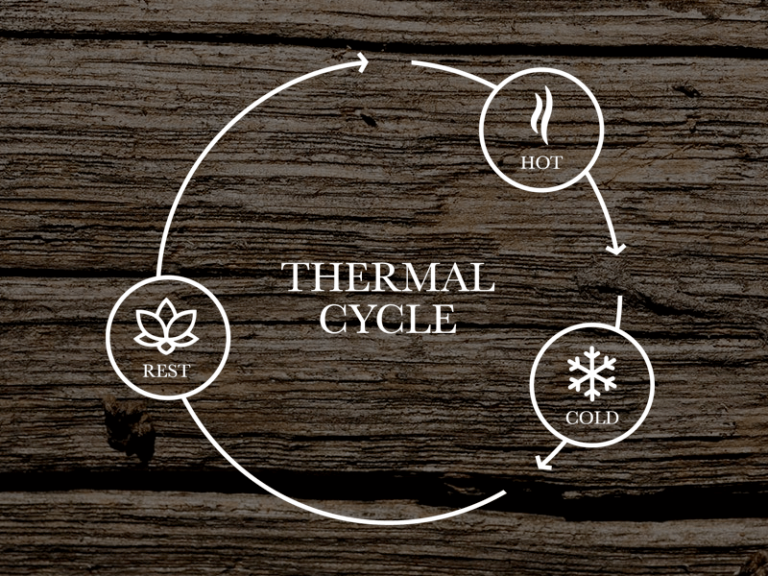 Choose one of the 3 cold pools as a 2nd step of the thermal cycle or to cool down a little during a heat wave. 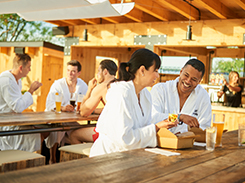 You can soak in one of the 6 outdoor hot pools or in the temperate pool at any time to relax and unwind completely. Rivër is the enormous waterfall that steals the show in the Borëa zone, near the Vaporo sauna’s exit. The icy water flows from the mountain and collects in a primary pool. 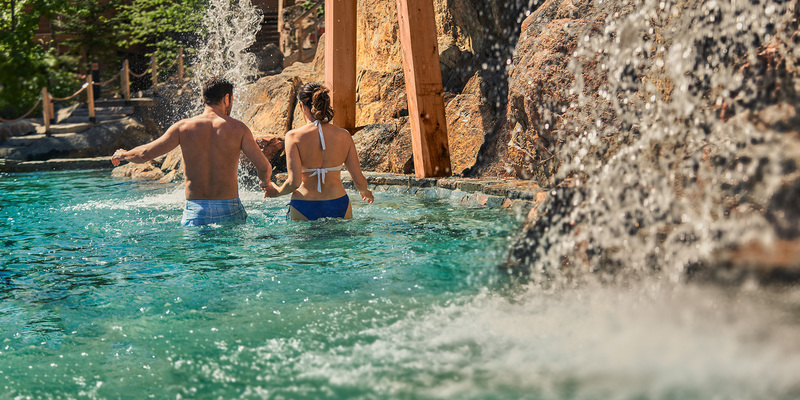 Pass right under the waterfall or submerge yourself in one of the two pools, it’s up to you to decide! Its temperature is 10 oC. The experience is challenging, but vey satisfying in the end. Dare yourself! Located in the Kaskad zone, the silent area at Nordik, Kristal is a cold waterfall from the mountain. 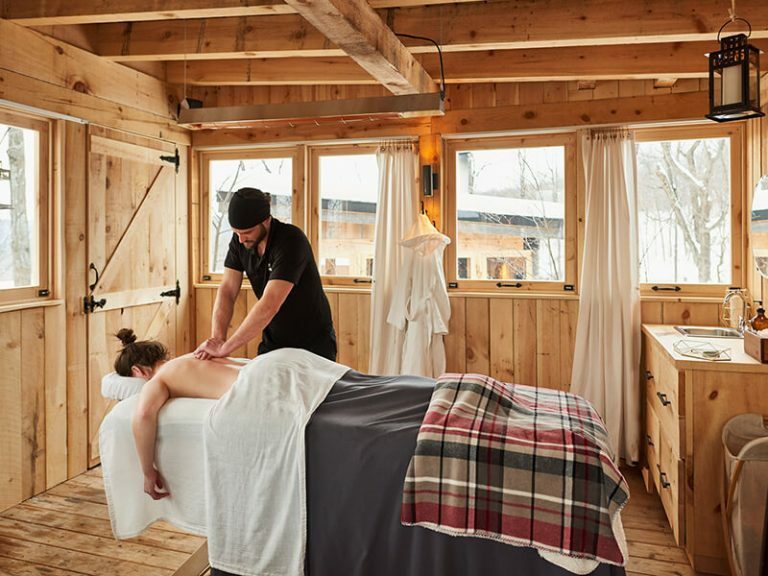 Somewhat hidden and perched above the Kalör hot tub, you will feel like you have travelled somewhere else entirely and become part of the sublime setting. A glance is enough to take your breath away, nearly as much as the water temperature (15 oC). The Kylmä pool is a small, aboveground glass pool. Its rectangular shape is reminiscent of an aquarium. Located in the social zone and facing the Panorama Lounge, your immersion in this cold pool will become a public performance. This is your stage! Kylmä is located near the Maa ad Tuli saunas. Its temperature is 15 oC. This temperate pool is located in the Borëa zone, a few steps from the Finlandia sauna. This is the best pool for your initiation into the thermal experience, because its temperature is about 21 oC. During a summer heat wave, the Tempër pool will be your oasis. The first and the warmest pool at Nordik! Facing Restö, Gëser is the warmest pool at Nordik! Its temperature is 39 oC. On a warm summer evening or a beautiful spring day, you will feel time stop. 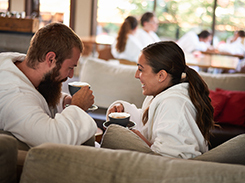 The water jets massage your muscles and relieve you of your daily tensions for greater happiness and well-being. In the evening, the pool is lit for an even more sublime experience. 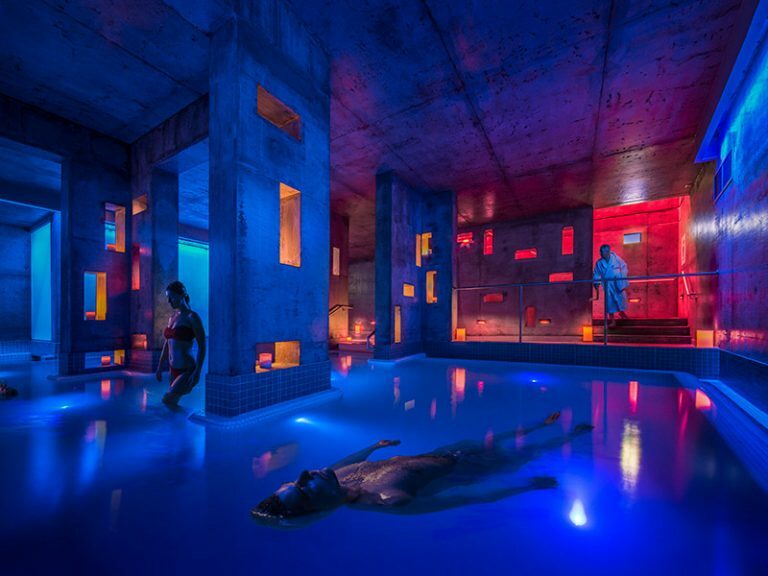 Features: The first and the warmest pool at Nordik! 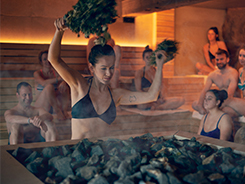 In the Kaskad zone, discover Kalör, the largest hot tub at Nordik. Its temperature is kept at 38 oC. With the mountain acting as a spectacular backdrop, Kalör is quite simply majestic. Näkymä is the enormous panoramic pool that offers a breathtaking view of Ottawa-Gatineau. 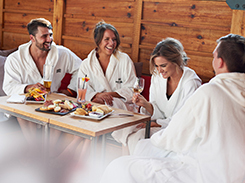 Head over to the Panorama Lounge to order yourself a glass of wine, then slide into the Näkymä pool to share moments in pleasant company, in any season. Its temperature is 37 oC. Two enormous new hot baths are now open in the Panorama section to expand your comfort and relaxation options. A first bath, a therapeutic Jacuzzi, pours into a second hot bath, which finishes its path in the Näkymä infinite pool. A technology imported from Germany was used for the therapeutic air bubble bath. In this bath, your body floats gently. Air bubbles have a soothing and comforting effect on the skin, tissue and nerves, activating your circulation and targeting your muscles and joints. The magic of air bubbles evaporates the stress and strain your tired body suffers, and strength, endurance and placidity return. Each of these baths can hold up to 50 people! 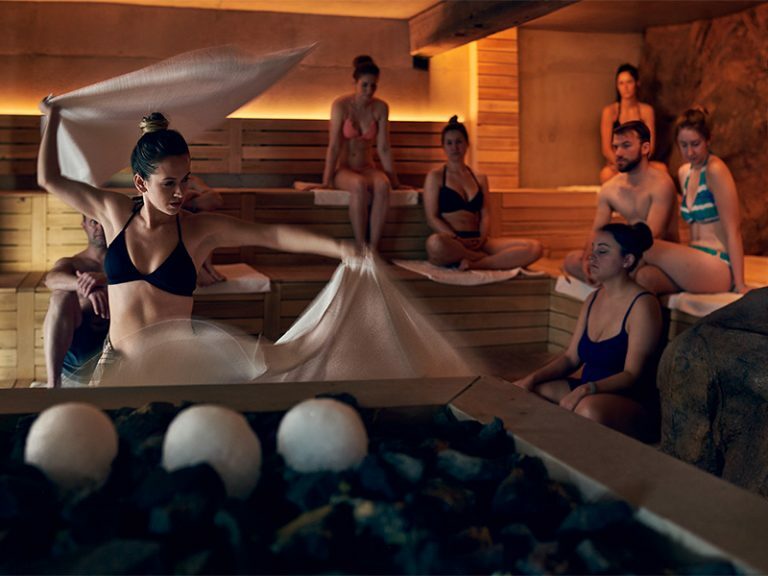 Carved into the rock and in symbiosis with nature, these baths offer a Hot Springs-inspired experience while evoking the Canadian Rockies. The water’s temperature is 37 oCelsius. Next to Espace Banyä in the Borëa area, discover the Onsën covered hot pool. Inspired by the natural hot springs of Japan, this brand new pool is covered, a first at Nordik! The pool is built from rocks and stone, its benches are perfectly shaped for your body. A gentle waterfall completes the experience and takes you away to sublime relaxation. Its temperature is set at 37 °C. Features: Covered warm pool, inspired by Japanese traditions. 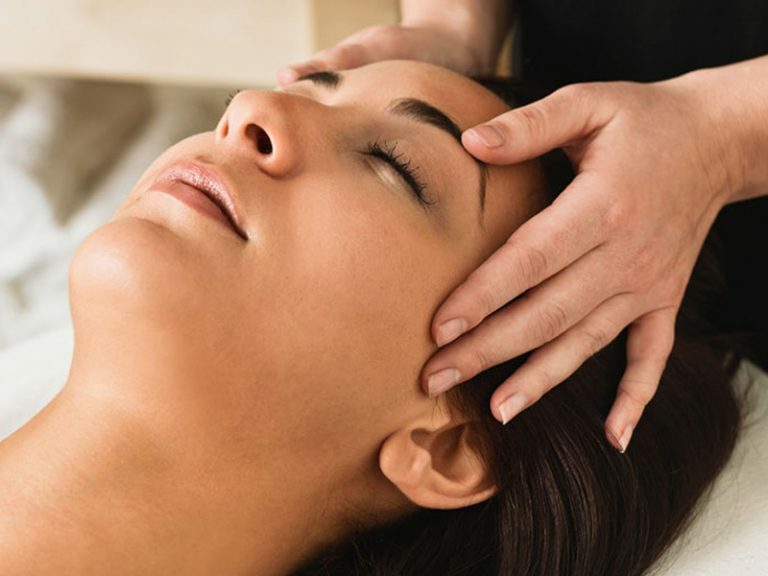 The very essence of our success as the largest North American spa centre in a natural setting is water. 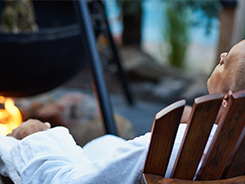 At Nordik Spa-Nature, water quality must not just be excellent, it must surpass all standards of excellence.